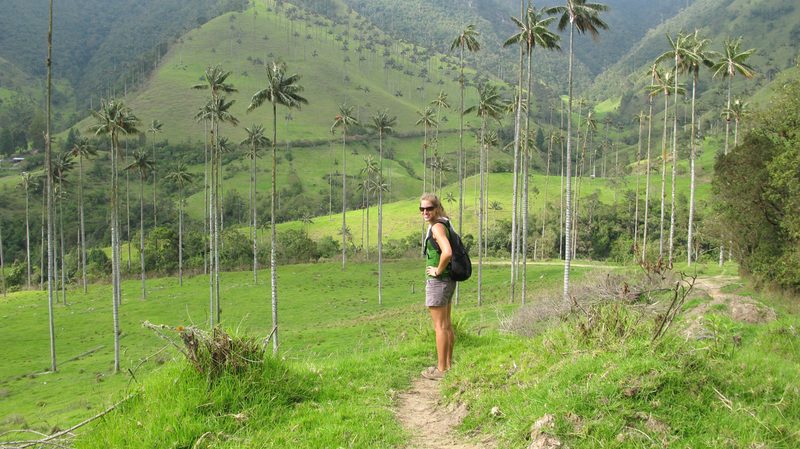 Hiking into the highlands of Colombia near Solento. After the excitement and drama of the Lost City trek, we spent a few days relaxing and resting around Santa Marta then headed back to our favorite city, Cartagena. It was sort of in the right direction and there were a few touristy sights that we had missed the first time. Those were the excuses I used, but really, we just love the charm of the old city and wanted to enjoy it all over again. 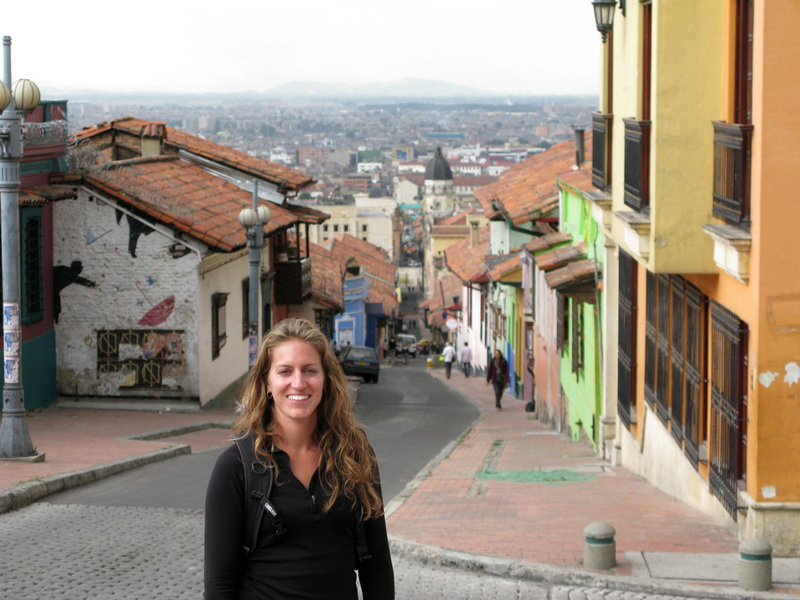 From Cartagena we caught an all-night bus to Medellin, the geographic heart of Colombia, and Pablo Escobar’s old hometown. 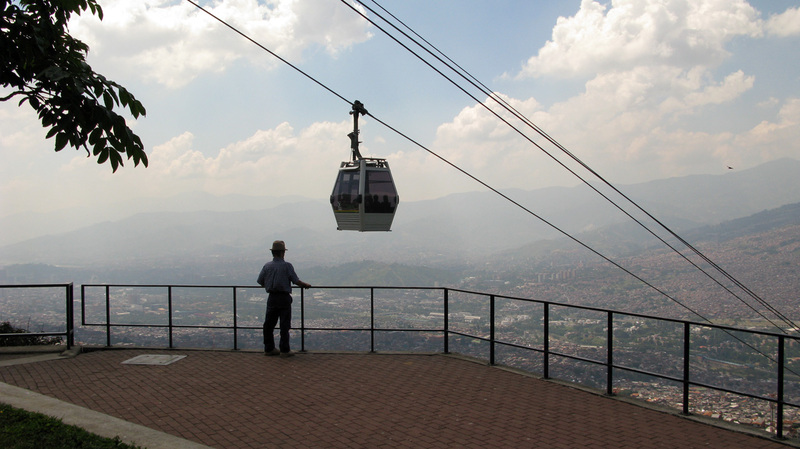 A lot has changed since they gunned down ol’ Pablo on that Medellin rooftop, and we enjoyed five days of exploring in this changed city. 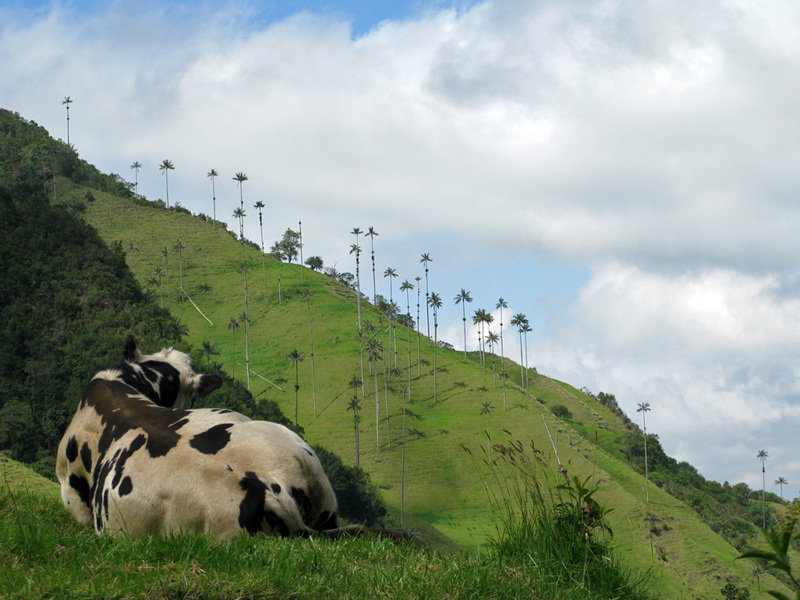 For the first time we entered the lush mountainous area that Colombia is most know for and which is far different from the Caribbean coast. 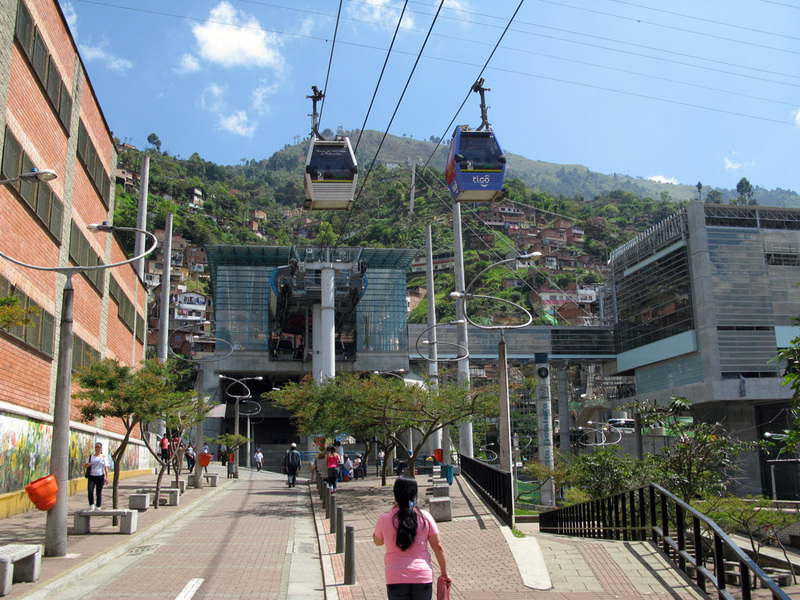 Luckily for us the hostel we checked into was conveniently located near the Medellin Metro, a perfectly executed public transportation system that’s clean, efficient and cheap. There’s a north/south main line and a western spur, plus a new gondola system that links the lower-income neighborhoods up in the hills surrounding the city. 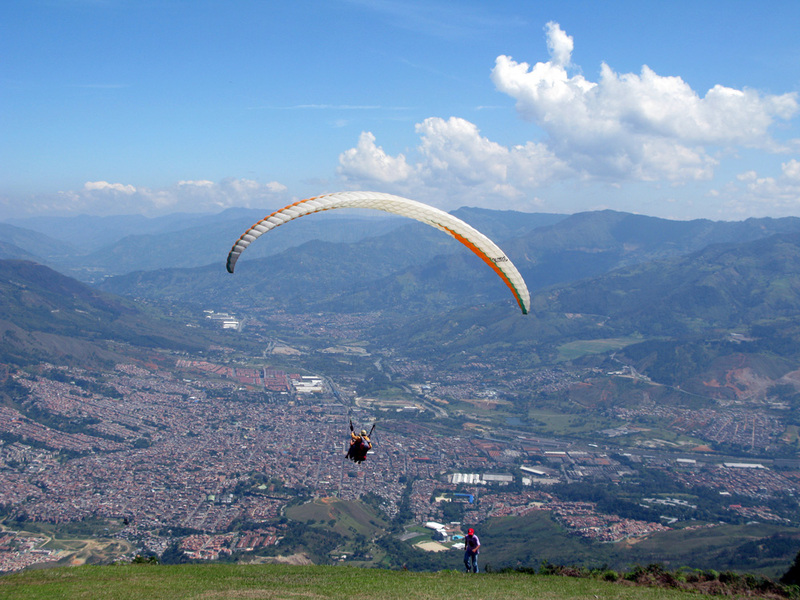 We spent a few days exploring the city via the Metro and also took a trip up to the mountains for some paragliding. It was beautiful! Caroline and her pilot ended up landing in the valley below and took a taxi back up top, while my pilot and I flew around the ridges for a while. We both had a great time. One of the Metro Cable stations, which connect the hilly suburbs to the Metro trains in the valley below. 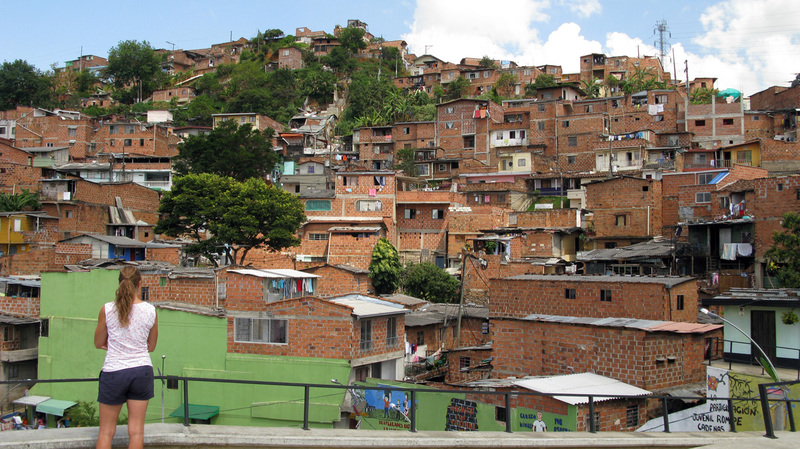 Overlooking Medellin from the Santo Domingo neighborhood. Santo Domingo is high enough above the city to have a cooler climate, it was fun to explore around the steep and narrow streets. 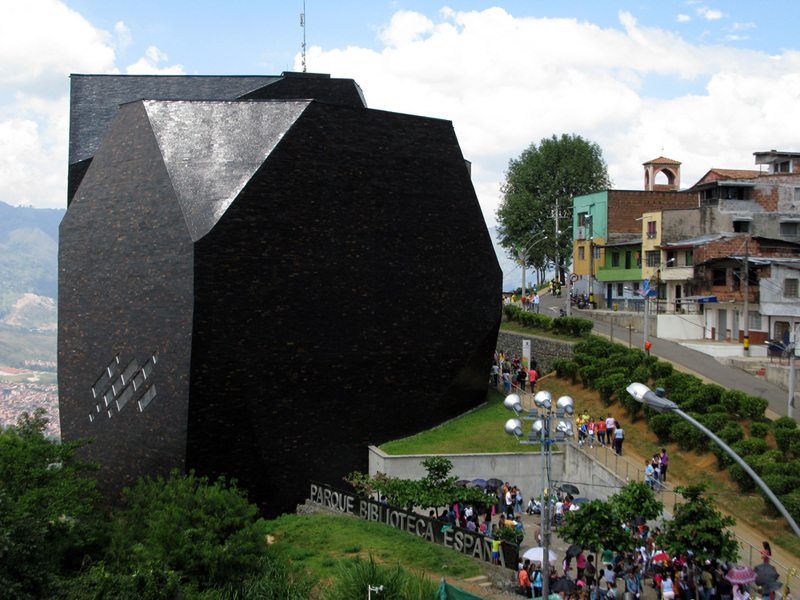 The Biblioteca Espana is a new public library on one of the many hills overlooking the city. 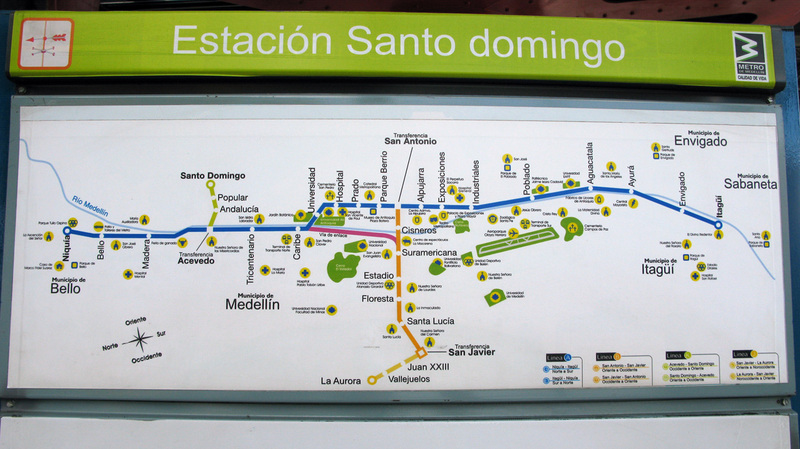 Metro map: we stayed near the Sur Americana station right in the middle. Caroline takes off on her first paragliding flight! 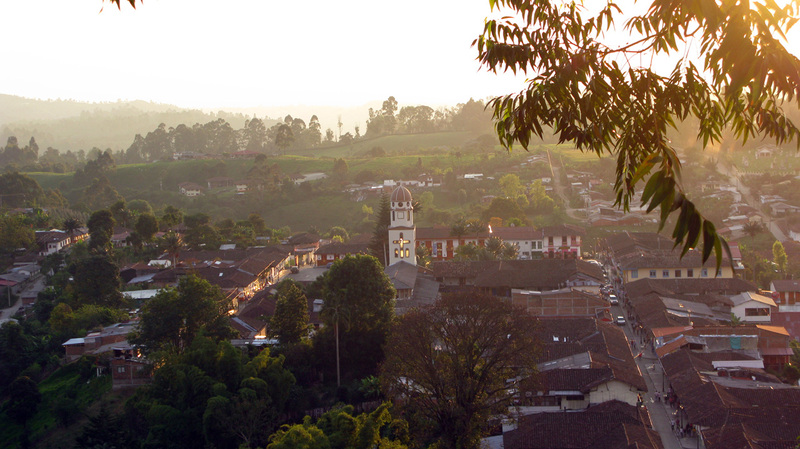 Continuing south we took a minivan (breakneck speeds, overtaking on blind curves, passenger throwing up in the seat behind us, the usual…) then a bus to the charming mountain town of Solento, high up in the Zona Cafeteria (Colombia’s coffee growing region). The evening we arrived was the last night of Solento’s annual festival, so we partook in some great street food, entertainment and enjoyed the fireworks. Following the good advice from an Argentine backpacker we met in Medellin, we stayed at Hostal Ciudad de Sergorba, which was more a B&B than hostel. 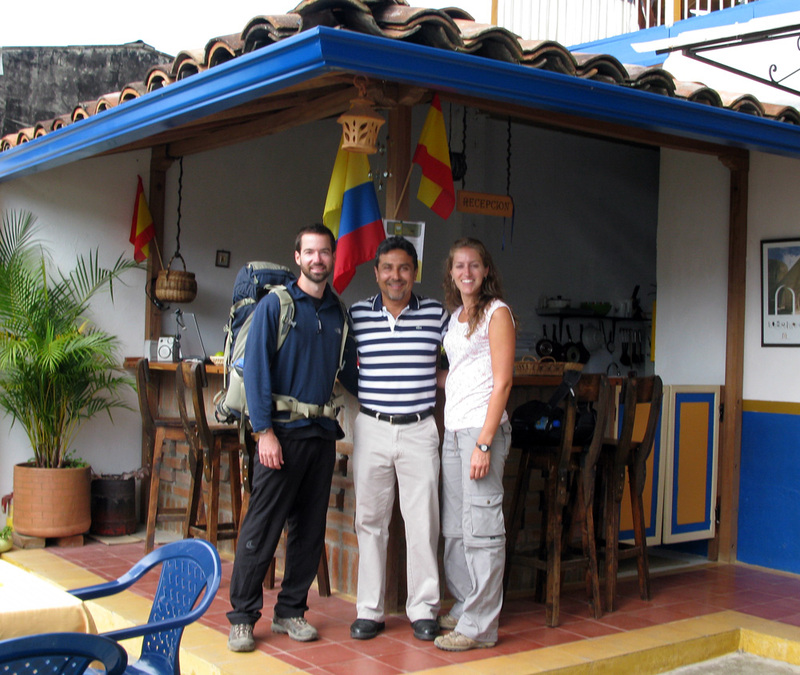 Enrique, the proprietor, was extremely friendly and made our stay there very enjoyable. 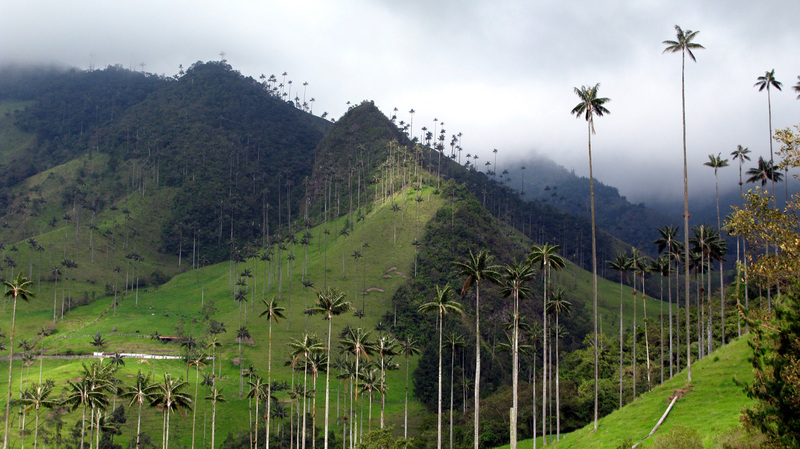 We went for a long day hike in nearby Parque de Cocora, a visually stunning region known for its tall wax palm trees that grow randomly throughout the cloud forest and farm land. We met two nice German backpackers Anne and Mario who joined us for the hike, and we all ended up getting briefly chased by wild horses. 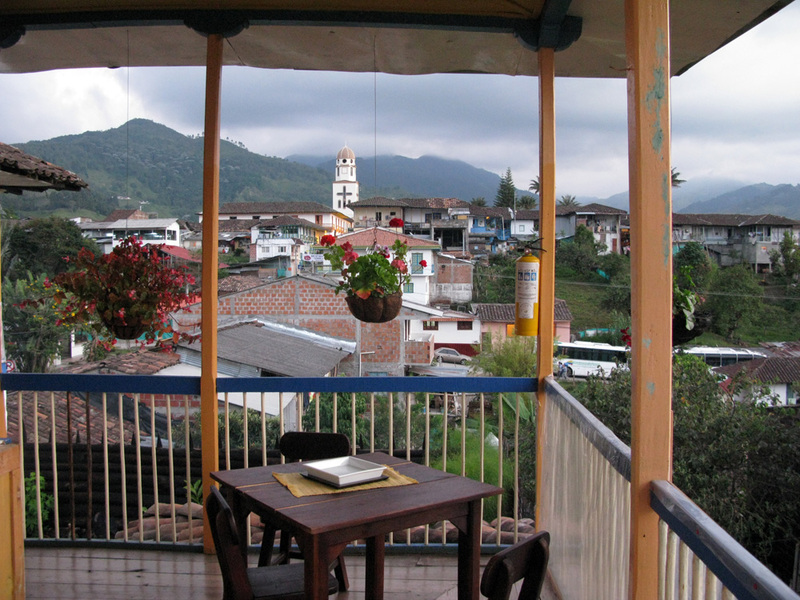 The view into town from our hostel. Ever friendly Enrique from the hostel in Solento. 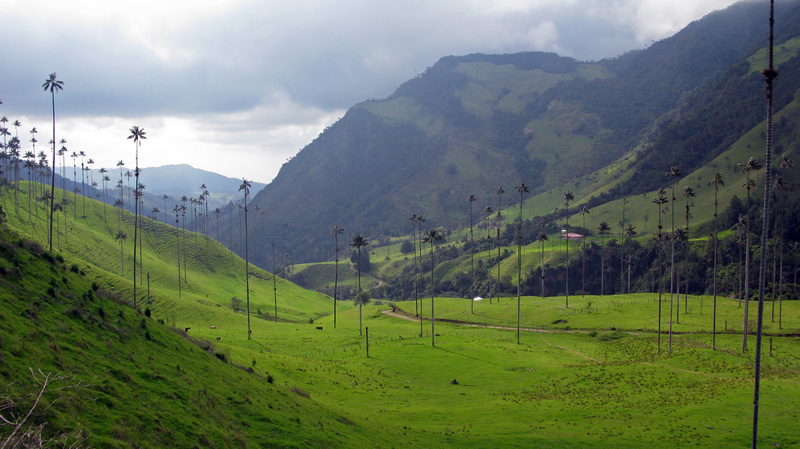 The wax palms drop into the farmland for quite the contrasting image. 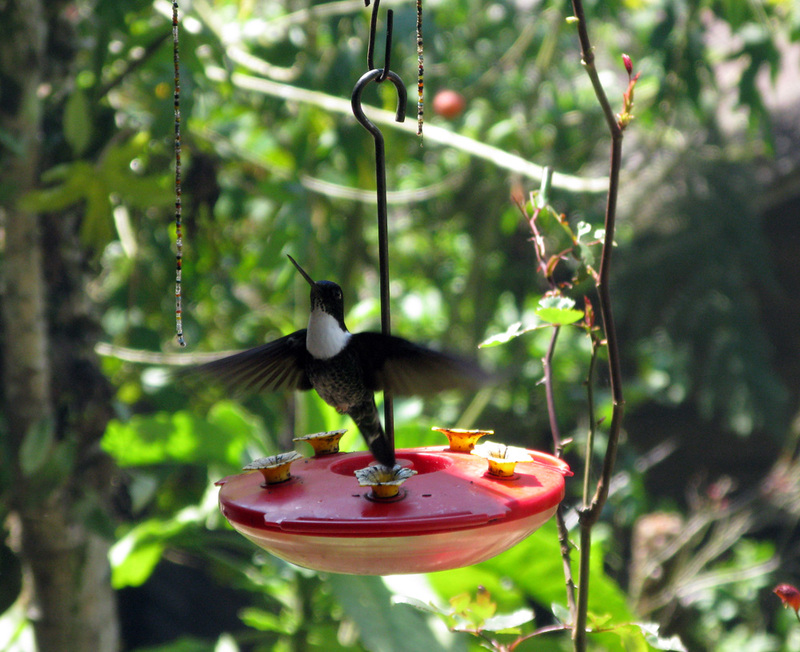 Hummingbirds were all over this feeder, at least five different types! 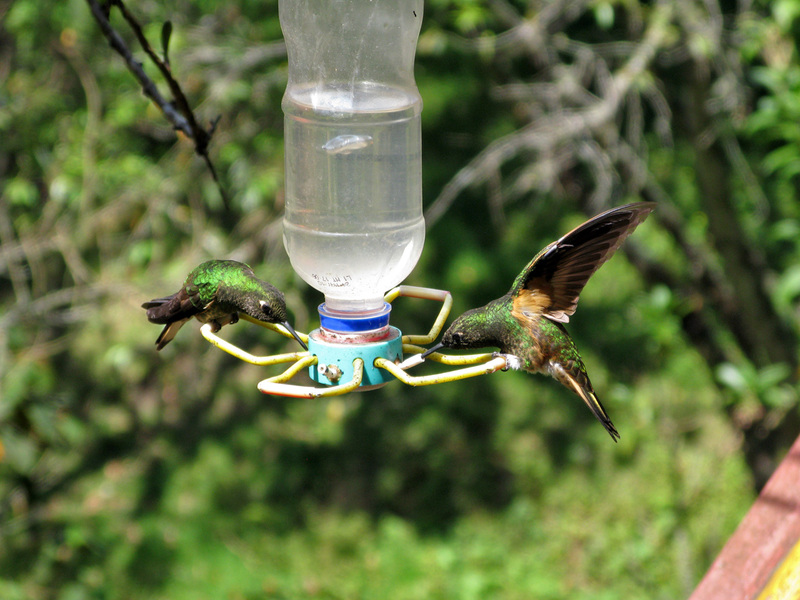 Hummingbird feeding time. This makes a great desktop background by the way. 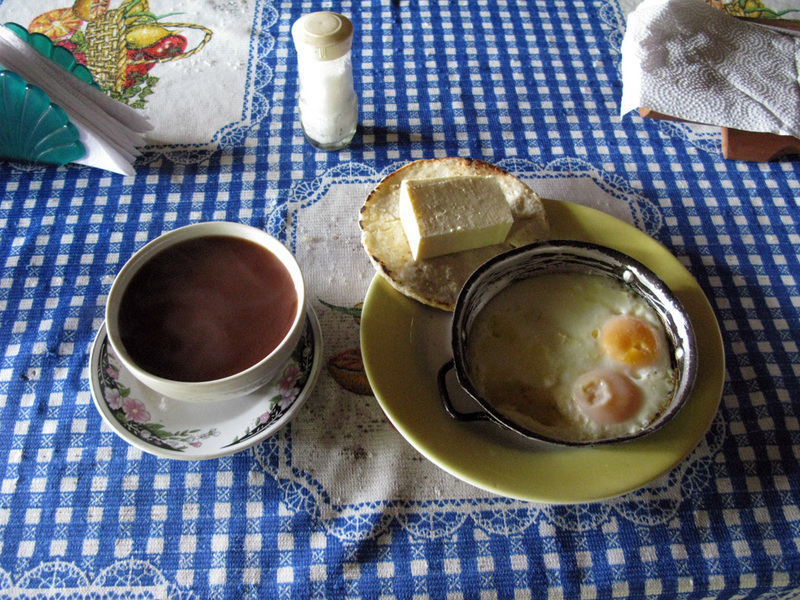 Lunch on the trail: Hot Chocolate, flat bread, block of cheese and two fried eggs. Cloudy up here but you can still see the sun shining in the valley below. 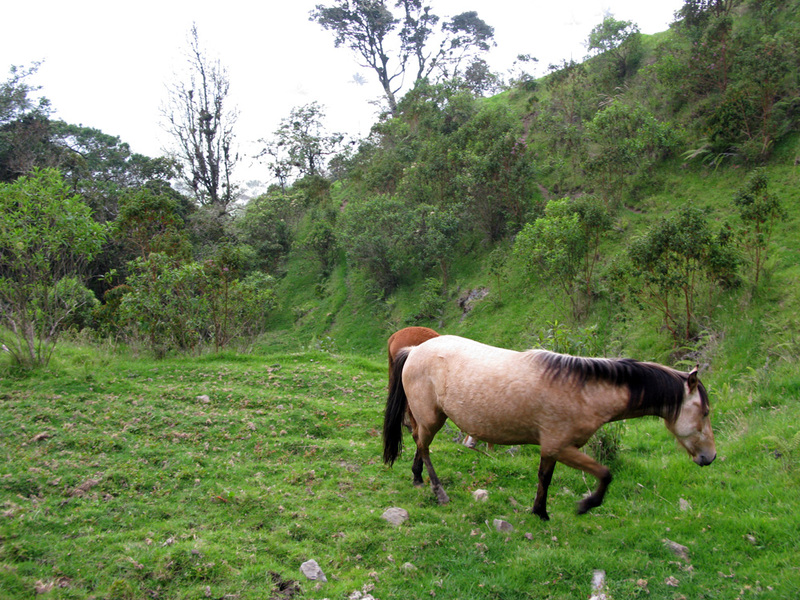 These friendly looking horses chased us down the hill just after I took this picture. It was sort of scary and funny at the same time. Eventually they just took off away from us. Our crew after having survived the horse chase: Anne, Mario, Caro and Me. Caroline takes in another great day. We hiked back down through these fields, a very surreal environment. 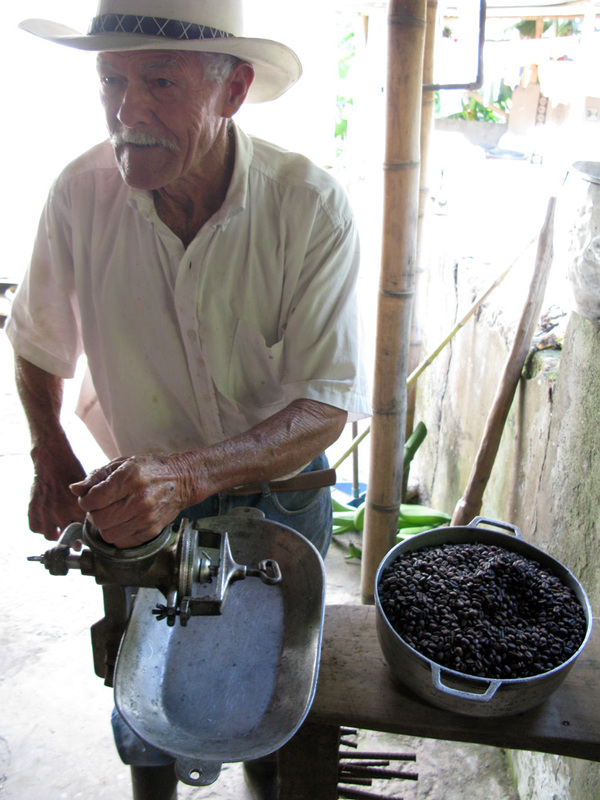 Mario joined us the next day for a tour of an organic coffee farm just down the road from Solento. Honestly, I’m not much of a coffee drinker but I’ve started to really enjoy it here. Plus I just feel dumb ordering tea in Colombia, it’s a coffee country. The tour was very interesting. 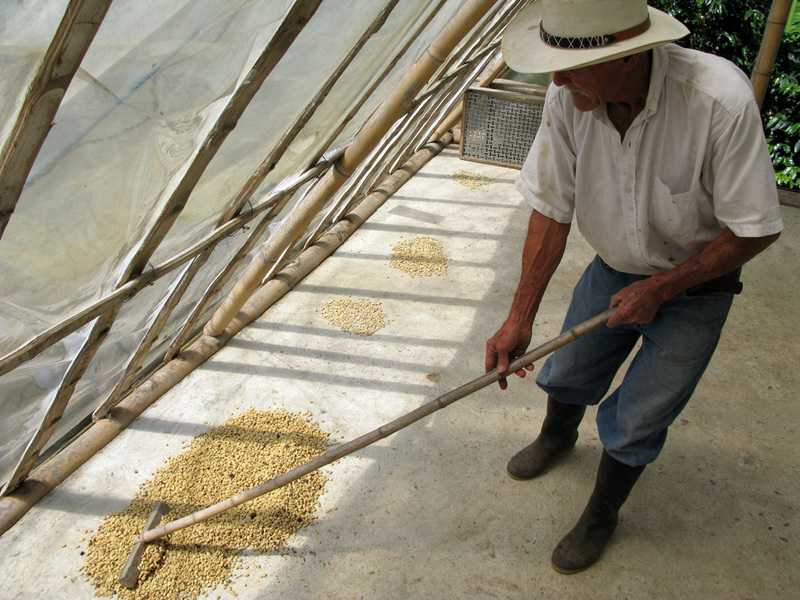 Since coffee needs lots of shade to grow best, they intersperse banana, orange, pineapple and other trees/plants throughout the property. 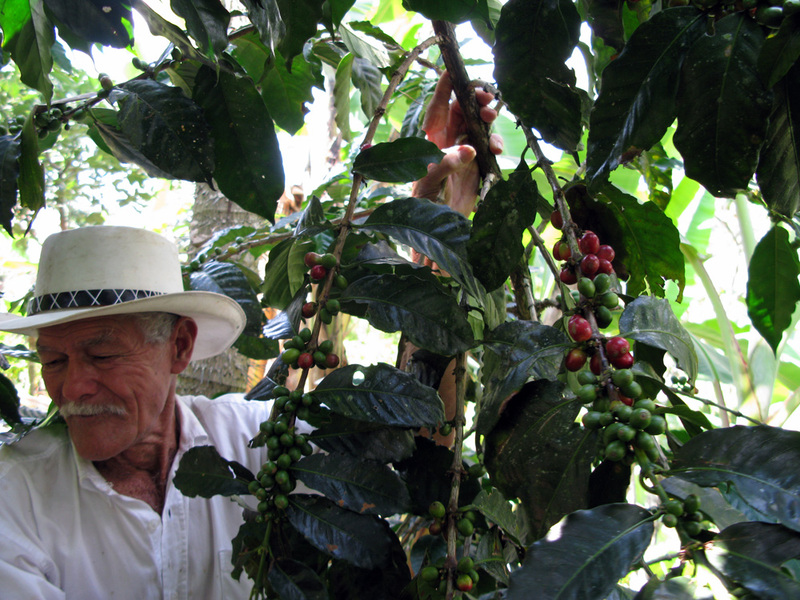 So as this nice old farmer was showing us the whole coffee growing/picking/peeling/drying/peeling/grinding process, we were snacking on some fresh organic fruit too. Pick the red ones, leave the green ones. 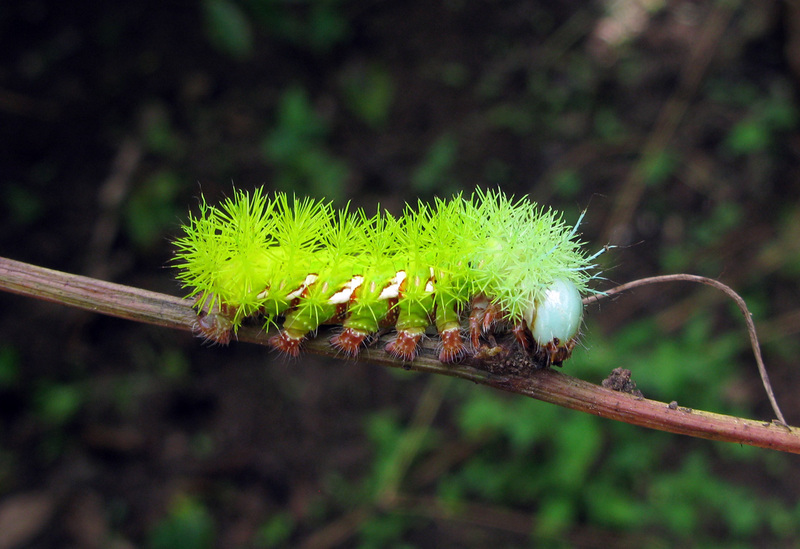 After peeling them, let them dry out for about 8 days or up to a month if it's been cloudy. After a 40 minute roast, you grind away. Nature's way of saying "Don't Touch." 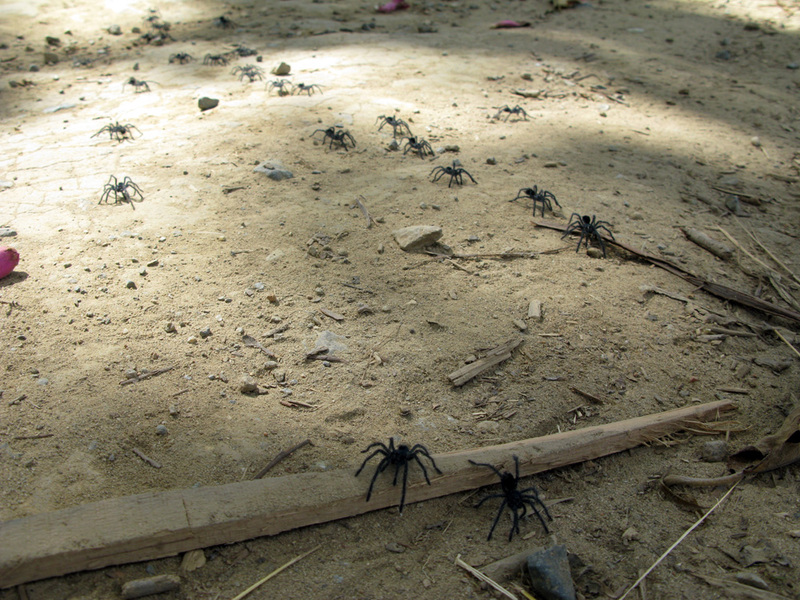 A popular spider path on the road to the coffee farm. 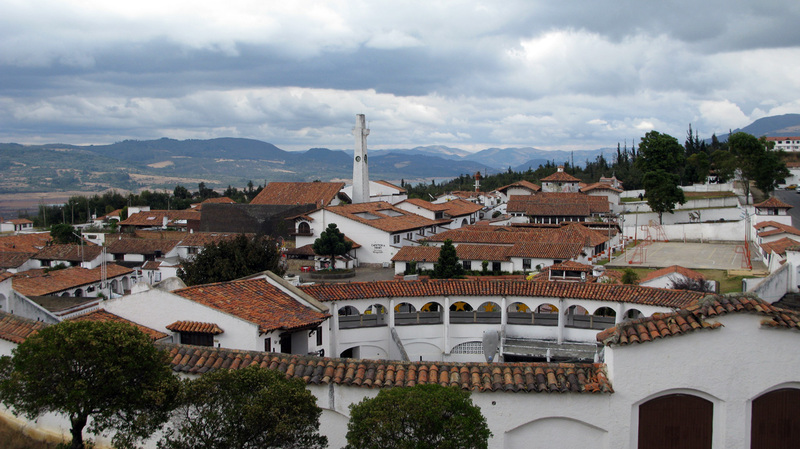 Our next stop was Bogota, the massive capital of Colombia. 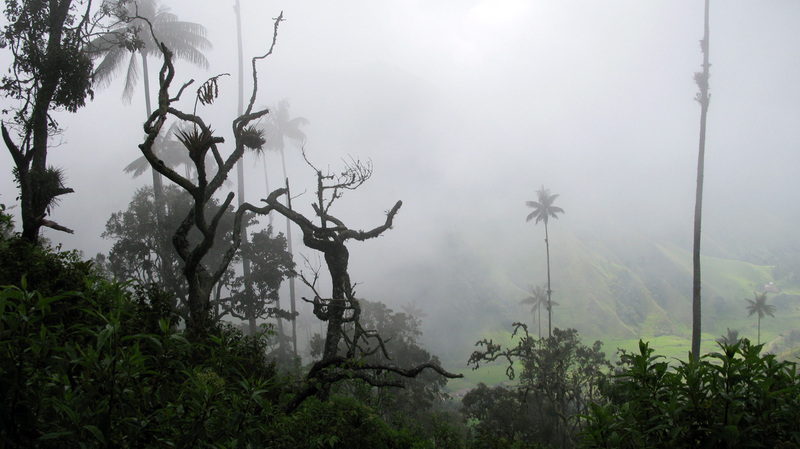 Once a place that was avoided by travelers, it is now a highlight of the country. We stayed in La Candelaria, which is the old colonial district in the center of downtown filled with trendy, tasty and cheap restaurants. The highlight though came from a personal connection through my Dad’s client Carlos. Carlos is a Colombian who lives in Frederick, but his brother-in-law Arturo runs a transportation & tour company in Bogota. Arturo graciously provided us with our own driver and van for two days! 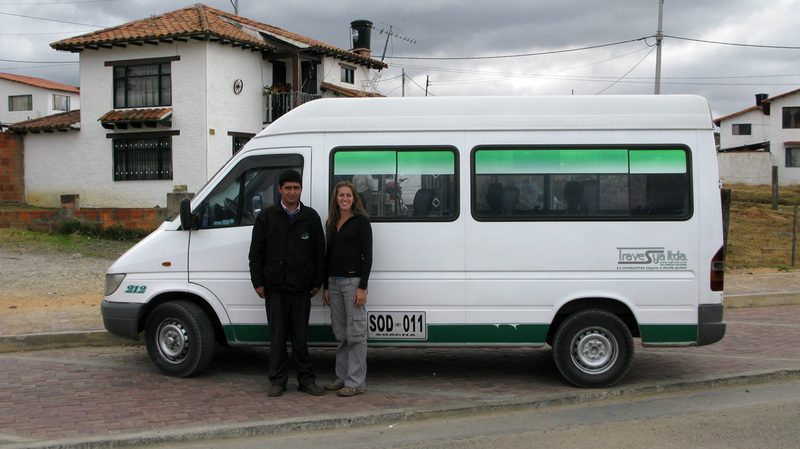 Fabio, our driver, took us all over Bogota and the surrounding towns for two days of sight-seeing. It was fantastic! 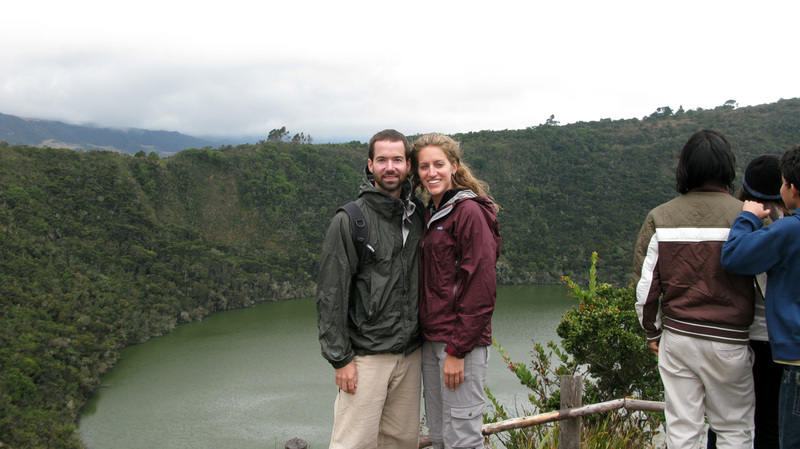 We hiked up to the sacred laguna outside of Guatavita and explored the massive underground salt cathedral in Zipaquira. Thank you! 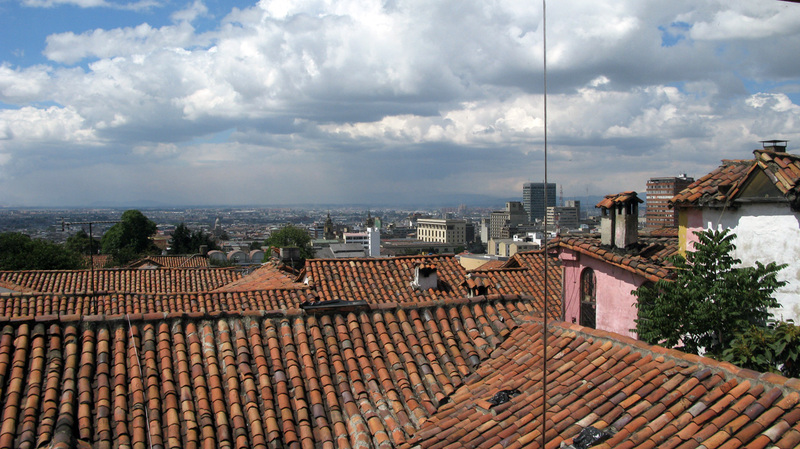 A fine view from our room in Bogota. Old Guatavita was a nice stop for lunch. Fabio and Caroline in front of our ride. 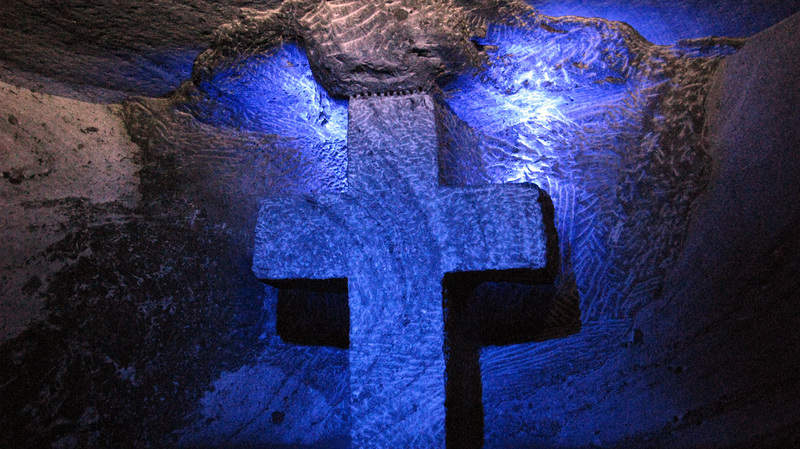 Down in the Salt Cathedral. 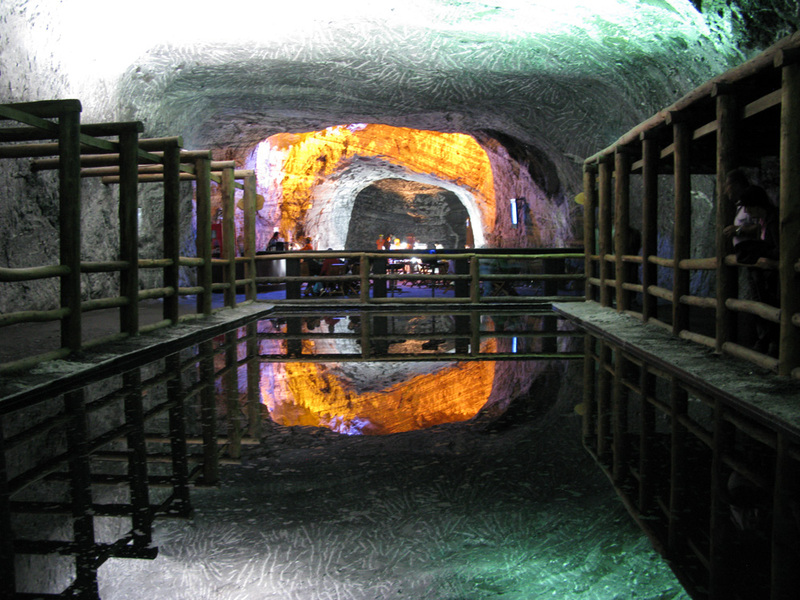 The mirror pond in the Salt Cathedral. This place was impressively huge. 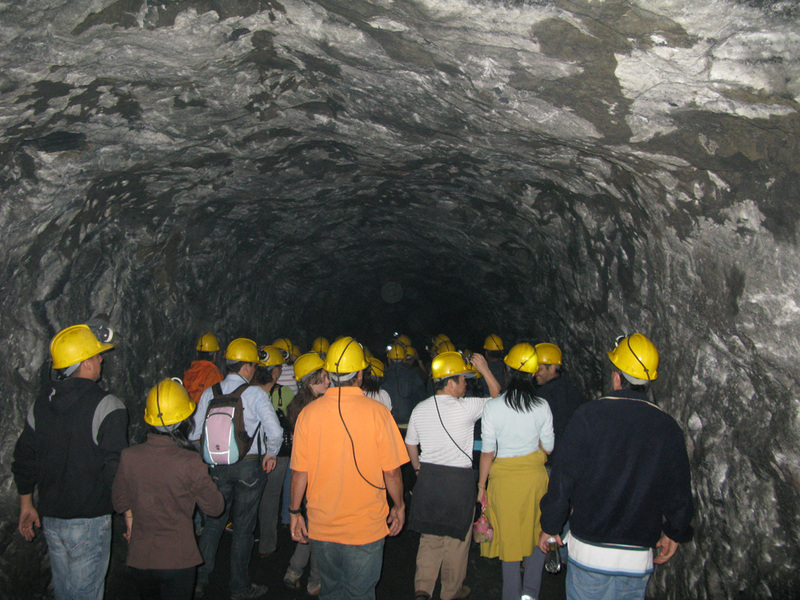 We paid a little extra for the 'Miners Tour' which meant we got to walk around with sweet helmets. 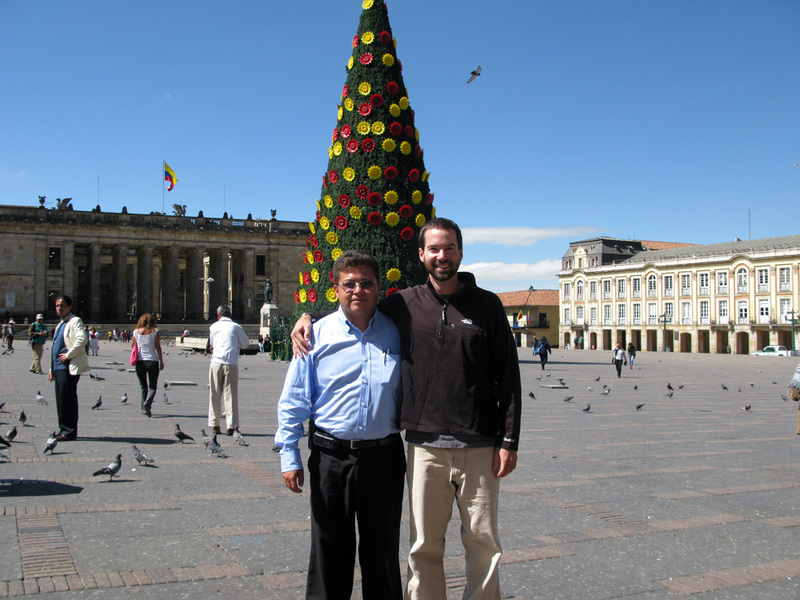 Arturo and I in Plaza Bolivar - downtown Bogota. 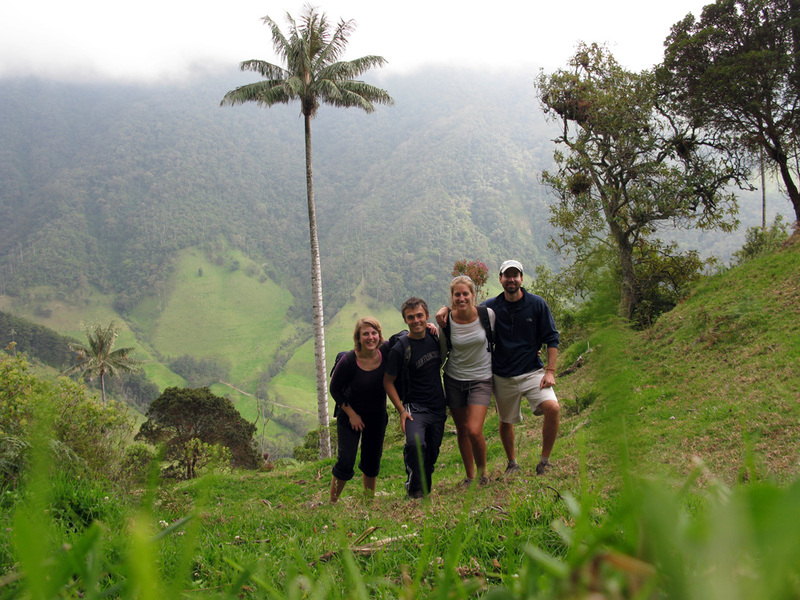 We were very lucky to experience some real Colombian hospitality. hummingbird pictures, you are so Dad. Do you have some emergency suet in your pack?? Luke liked the caterpillar best! Your adventure is beyond words, FOR ME, but I enjoy every line of it, so well illustrated. We were away in Sedona, Arizona, for the passage to the new year. We explored all vortexes and as many trails as possible in a short period of time, went to the Grand Canyon, but it almost sounds lame compare to what you are experiencing. 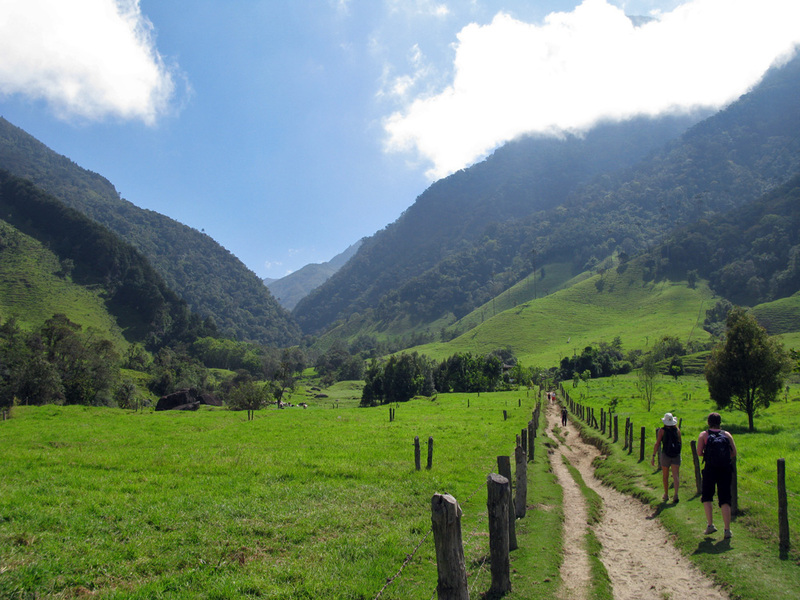 Keep on trekking, I love to read about your adventures and discoveries. Bons baisers d’Ottawa. can i have the credits and the HD of one of your images in colombia (metro cable) to publish it in revue please ? can you give me your email to contact you for more informations ?